Even though the enhanced DSP engine is worth the price admission, Studio1 just gets better. Studio1 is the only SDR program available that takes a “workstation approach” to using and managing your SDR receiver(s). First off all the Studio1 user interface is gorgeous and looks far more professional than the other SDR software offerings available at this time. Lots of time and detail has been put into the Studio1 displays and controls and it shows. Most of the displays can be highly customized to the users needs. Let’s take a look at how the Studio1 “workstation approach” can be put to use. To better understand the Studio1 “workstation approach”, let’s break it down a bit. First of all, let’s discuss the concept of the Studio1 “application instance”. This simply means that you can run multiple copies of Studio1 simultaneously. For example if you have two or more SDR radios, you can customize Studio1 for each radio. This is done very simply making additional copies of the Studio1 program folder and placing the files needed to support that radio into the folder. For example, you could create a folder for your RTL2832U receiver and simply place the needed ExtIO file in that folder. If your second radio was lets say a FunCube Dongle you would do the same for that radio and so on. Keep in mind that you will also need to install any USB drivers needed for you radio also. Now for example ,when you start Studio1 in the folder you have set up for the RTL2832U, that radio will automatically be used. You can then start Studio1 again in FunCube dongle folder, then that SDR radio will also be in use simultaneously along side of the RTL2832U SDR radio. Each instance will also save all the settings that you have made for each individual radio. You may also use the same approach for SDR radios that need sound card support such as Softrock type SDR radios. So in essence, you can run an audio card based SDR along side of a TCP based radio. SP1 – This is the main Spectrum Display window. This typically shows the spectrum display for your receiver typically using a waterfall / waveform click tuning type display. This window can be resized and moved to fit anywhere on your screen. The display can be tweaked any many ways to the preference of the user. You can zoom the display in and out to show smaller or larger segments of the band. Sp2 – The Auxiliary Spectrum Display shows the spectrum in a down-converted path. The SP2 allows you to modify the selectivity filter as well as modify the four available notch filters. This window is also movable and resizable. RX Control Window – The RX Control window allows you to set the tuning of your SDR hardware and receiving mode. Speaking of receiving modes, Studio1 provides AM, SAM (synchronous AM), LSB, USB, DSB, FM (NFM, MFM, WFM, SWFM), CW, and USER modes. The RX window also has an S-Meter or Center Tuning Meter, Band buttons, four Notch Filter buttons, RDS decoder, Volume and Squelch, Filter settings, and VFOA and B buttons. RX EX Control – Allows access to features that are not frequently used such as parameters relative to notches, noise blanker, noise reduction, soft filter, SNR (Stereo Noise Reduction) ,etc. Studio1 allows you flexibility to arrange and size these windows to suit your needs. If you happen to be using a multiple monitor setup, you can spread these windows across your monitors as needed. An additional nice feature is the ability name and save your arrangement as a “Workspace”. You can have up to 10 named workspaces that can be recalled as needed. This where Studio1 can be pretty cool. For every instance of Studio1 you can create multiple Virtual Receivers (VRX). What this basically does depending on the Bandwidth of you SDR receiver is allow you to create separate receivers each having its own custom settings and its own SP1, SP2, and RX control window for different segments of your receiver . This will allow you to monitor more than one signal or chunk of bandwidth simultaneously. 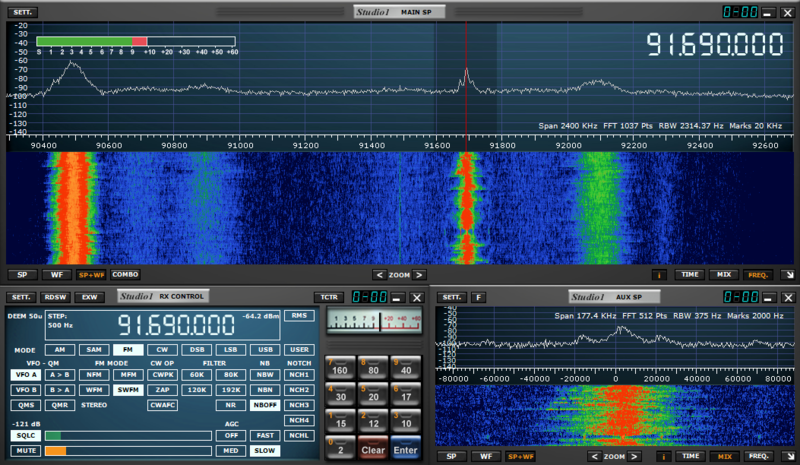 Let’s say for example that you SDR hardware can cover most of the 20 Meter amateur radio band. You can create one VRX just for browsing around the SSB band. You could create another VRX to constantly monitor a net frequency you are waiting to become active. Just set the squelch and wait for the Net to become active while you browsing around on the first VRX. You could create another VRX to monitor CW signals and so on. Another good application would be to use one VRX to monitor 20Meter SSB and setup a second VRX on 14.070Mhz sending it’s output using Virtual Audio cable to a PSK31 decoding application. You could do the same thing with something like CW skimmer. The VRX approach gives you plenty of flexibility in using your SDR. Again not many (if any) of the shareware programs offer this feature.